A Toyota Corolla is a safe choice for a car. A boring choice. Reliable, bland, cheap and basic transportation. There is no shame in this. But it makes the Corolla an extremely unlikely contender to be one of the stars of the fastest growing motorsport in America—drifting. Tonight on Car vs. America—still not canceled yet, despite an unusually aggressive campaign by various religious groups!—our car boys Mike and Raphael go drifting. The boys are here to haul this thriving but often misunderstood car culture out of the shadows and into your living room. They head to Old Bridge Township Raceway Park in Englishtown, New Jersey to get a demonstration and ultimately try to get things sideways themselves. Shenanigans abound. And while they’re in the Garden State, they visit Newark to meet Hector Correa, Englishtown’s drifting tech inspector. 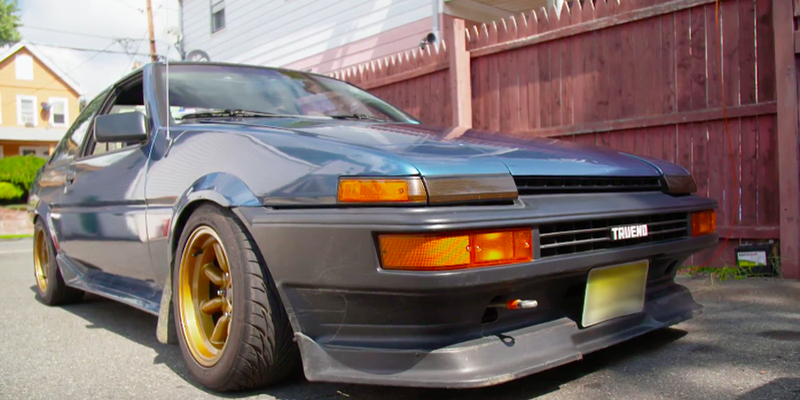 Correa’s a Corolla man, and among his collection is an interestingly Nissan SR20-swapped ‘81 Corolla sedan. In this clip he explains that he started with a Nissan 240SX, another star of the drifting scene, before switching to the smaller and lighter Corollas of the ‘80s. Back then, for a time at least, there were versions of the Corollas that were small and light and rear-wheel drive and reasonably sporty, which made them ideal to modify for drifting when the sport got its start in Japan. The AE86 generation of Corolla is perhaps most famous for starring in the drifting anime Initial D. That fiction has its roots in reality. The AE86 a great choice for drifting, if you can find one today that hasn’t been abused to death. That’s something you can’t do with modern ones, as the Corolla lineup has gone exclusively front-wheel drive—and boring. But the Corolla’s legacy to the sport is important and thriving even today, and for that reason it deserves more respect than it probably gets. Check out this episode TONIGHT at 8 p.m. ET and PT on Fusion. Find out if you have Fusion here, and check out how to get the Watch Fusion app on Amazon Fire TV & Stick, Roku, Chromecast, iPhone, iPad, Android Mobile, Android tablets and more. Don’t have cable? You can still catch it on Apple TV and the Sling app.